The St. Louis Lions Club was chartered in 1968. St. Louis Lions Club is the primary fundraising community organization in St. Louis. New members are always welcome, please contact any existing member for information. We are very proud of the many contributions that we have made to the community. The Club has been a major partner in the building of the St. Louis Skating Rink along with many renovations to the building, assisted with installation and repairs of the artificial ice plant, installation and upkeep of softball diamonds and upgrades to the beautiful Lions Park. St. Louis Lions Club host many annual events including the Elimination Cash Draw, Snowmobile Rally, the wonderful top-notch Music Gala, Santa Day for the kids, New Year’s Eve Fireworks Show and free community barbeques, just to name a few. Please support all Lions Club initiatives as all the money raised by the Club stays and supports worthwhile projects in the community. Meetings are held on the 1st and 3rd Thursdays of each month at the Lions Club Room in the St. Louis Community Hall. On Monday February 26, 2007 at the Governor’s visit in MacDowall the St. Louis Lion’s Club had 7 new members installed. 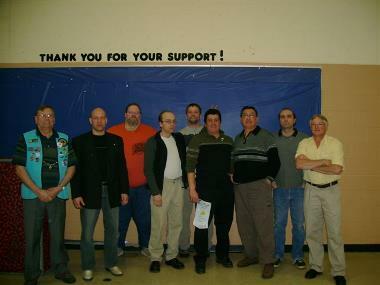 These new members included Edward Lussier, David Jeffries, Derek Jenny, Jessie Carey, John Watson, Shane Jenny and Marcel Trumier. The Lion’s Club would also like to welcome Dave Doucet to the Club.